I should admit this up front: Linda Ronstadt was one of my boyhood crushes. She had those big doe-eyes—and looked lovely in short-shorts—which made her a beautiful young 1970’s woman. But what really moved her to the top of my personal chart was that voice. Hearing her sing plaintive songs like “Blue Bayou” or “Ooh Baby Baby,” then bust into a rocker like “Poor Pitiful Me”—and sing both styles with such natural grace and power—moved something in my heart. And amazingly, she didn’t even know how to sing yet. 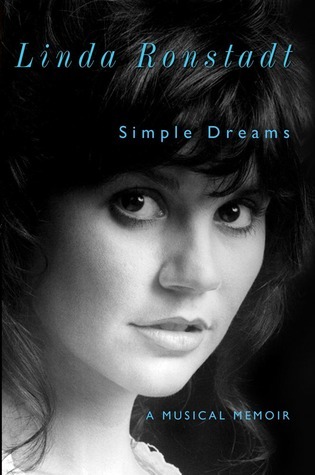 Linda Ronstadt’s autobiography “Simple Dreams” is subtitled “A Musical Memoir,” and that is truly fitting. The entire book traces her love affair with music. Ronstadt grew up in Tucson, in a house filled with music. From traditional songs echoing her Mexican heritage, to lush, Nelson Riddle-orchestrated Frank Sinatra albums, there was always a plentiful variety of music playing. Beyond records, her extended family and friends would gather nearly every Sunday. After dinner—and a few tequilas—folks broke out their guitars, and everybody sang. Linda’s brother was a renowned boy soprano, and he would harmonize with his two sisters on country standards they heard on the radio. Music wasn’t just background in the Ronstadt home, it was very much a shared, hands-on part of their familial life. “Simple Dreams” spends a good deal of time talking about Linda’s rise to stardom, and a good deal of time talking about what she did after she was the 1970’s Queen of Rock. Where she skimps a little is on her glory years, where she and her band sold-out arenas all over America, and her hits dominated the charts. Linda Ronstadt wasn’t thrilled with the big arena show era, playing her hits night after night in huge, acoustically dreadful venues. She wanted to grow as an artist, to improve, and most of all, to make the music she’d always loved. When I said she didn’t know how to sing, I take that from her own story. Okay, she could obviously sing well-enough: she had a good ear for melody and harmony, and she had a lovely voice. She had those tools from childhood, though. Where she really began to hone her skills to their fullest potential was when she began working on projects outside rock & roll. She talks at length about working with legendary Broadway producer, Joseph Papp, who cast her as the female lead in “Pirates of Penzance.” She was so used to belting rockers or crooning ballads, that she had never developed the range and skill required to sing on Broadway. She could hit the notes and carry a tune. What she lacked was control and phrasing, as well as learning to sing with technical correctness, so as to reduce stress on her vocal cords. Her work with a legendary voice coach during “Penzance” helped her immeasurably. One constant presence during her successful years was her manager, Peter Asher. When Linda wanted to take a different route beyond the lucrative routine of “album-tour, album-tour”, Asher supported her. He did so very reluctantly—telling her she was throwing her career away—but he made her projects happen. And he repeatedly ate his words, as one odd turn after another sold millions of records and won armloads of Grammy awards. From her “Trio” projects with Emmylou Harris and Dolly Parton, to her standards recordings with Nelson Riddle, and her Spanish music projects, Ronstadt continued to experience success and grow as an artist across a variety of musical genres. Just as she chose her own musical projects, Linda Ronstadt here chooses to tell her story her way. There is no ghostwriter on this book—it’s all Linda Ronstadt, and she’s a gifted storyteller. Also, for somebody who at times led a high-profile life, she remains markedly guarded—her personal life is her own. “Simple Dreams” mentions her longtime relationship with California Governor Jerry Brown only in passing, except for one short paragraph where she toasts their years together and wishes him happiness with his new wife. Linda Ronstadt wasn’t looking for a husband, nor pining for true love. The point of her forty-odd year career wasn’t fame or fortune (at one time, her big financial goal was to make enough money on tour to buy a new washing machine). She wanted to sing, to use her gift to its fullest, and ultimately to introduce a wider audience to the wonderful, magically eclectic blend of music she grew up with. Retired since 2009, Ms. Ronstadt can look back on her career proudly, and know that she’s done just that.